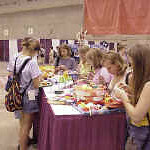 The 2000 ELCA Youth Gathering attracted some 40,000 Lutherans of high-school-age and their adult sponsors, June 28-July 2 and July 5-9 at the America's Center in St. Louis. 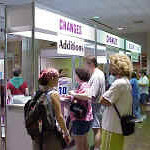 Once they arrived, groups went to the America's Center to register. "The Beat" was an interactive display area at the America's Center. Here, a group of Youth Gathering participants make a memento at one of the display tables. 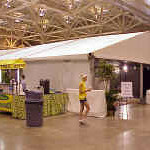 The ELCA churchwide organization was represented at "The Beat" with a large tent at the America's center. In it, participants made "masks" of their faces and played "Who Wants to Be a Missionaire." Nearly 12,000 ELCA Youth Gathering participants took part in more than 100 community service projects in the St. Louis area during the two-week period. Here, one of the participants is helping to clean-up at a north St. Louis independent living facility for retired people. 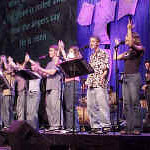 Music was an important part of 2000 ELCA Youth Gathering. Mass gatherings at the Trans World Dome at America's Center featured a band and choir made up mostly of high school-and college-age young people. The Trans World Dome floor and first deck were filled with Lutherans from throughout the church during Mass Gatherings. 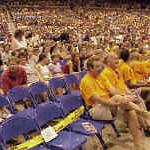 Inspirational speakers were featured at many of the 2000 ELCA Youth Gathering events. Mike Yaconelli, Yreka Calif., is co-founder and owner of Youth Specialties, an international organization that trains and provides resources for more than 100,000 youth workers worldwide. 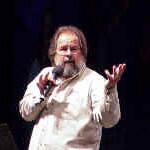 Yaconelli is also a lay minister for Grace Community Church. 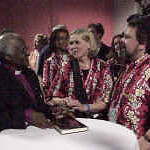 Archbishop Desmond Tutu, retired Anglican archbishop of Cape Town, South Africa, and winner of the Noel Peace Prize brought a powerful message of peace and reconciliation to the 2000 Youth Gathering. He attended a reception in his honor following his presentations. 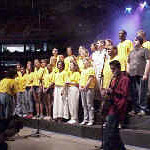 A choir made up of a participants who attended the Multicultural Youth Leadership Event which preceded the 2000 ELCA Youth Gathering, performed at the closing worship service at the Trans World Dome. ELCA Youth Gathering participants celebrated Holy Communion at the closing worship service.